In the ongoing battle over reproductive rights, Ohio has set itself apart with the absurd props employed in its abortion debates. The state's anti-abortion movement is kind of like the Gallagher of oppressing ladies. This is the place where the legislature was subjected to live ultrasounds of pregnant women and testimony from fetuses, but now they've truly topped themselves. This week, an anti-abortion group sent children into the offices of state legislators by themselves to deliver a message on the rights of fetuses. Prepare to have your jaw drop, because the group Faith 2 Action didn't find sending children to do their dirty work sufficiently exploitative. 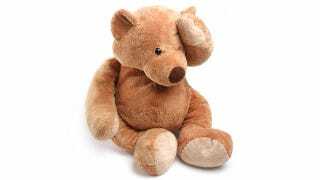 Ohio Senate staffer Leo Almieida tells the Huffington Post that on Tuesday morning, two girls who were about nine or 10 entered his office while holding a teddy bear. They squeezed the bear and it played a recording of a fetal heartbeat. The girl then recited a statement asking Almieida's boss to support the "heartbeat bill," which could ban abortion as early as six weeks into pregnancy. She seemed really, really nervous ... I've had other kids come into the office with adults, but usually the adults introduce them and explain what the group is trying to do. I've never had just a kid come up alone. I'm not at all supportive of the bill, and I'm not supportive of them sending kids in my office with a teddy bear that mimics a heartbeat, either ... I thought that was a very cheap exploitation of kids. I would rather them come in my office and ask to sit down and talk about it, rather than send a kid into my office. I didn't like it at all — in fact, I didn't even want the teddy bear. Did Faith 2 Action expect legislators who've decided they're pro-choice after years of carefully considering the facts on abortion to say, "Wow, I thought abortion should be legal, but this nine-year-old is pretty damn pursasive!" No, that's just silly. Faith 2 Action didn't think they'd be swayed by the kids' arguments, but by the fact that they're cute. (They added the teddy bear to compensate for a few kids who weren't as gifted in the looks department.) How could you support a woman's right to do what she wants with an ugly, bloody organ like the uterus when an adorable kid clutching a stuffed animal tells you not to?